By David Butterfield, submitted December 13th, 2003. 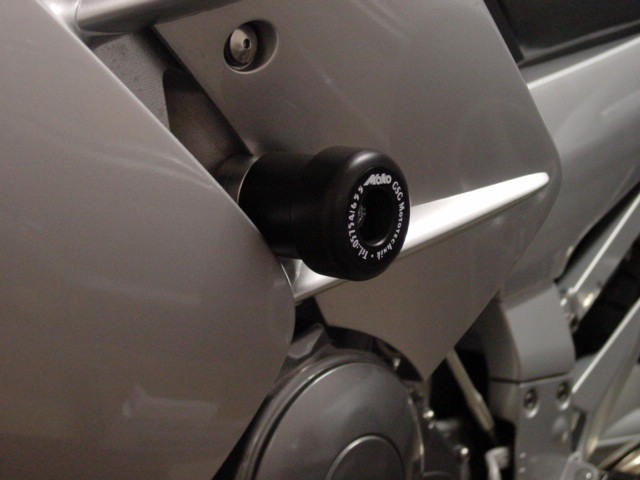 Not being a fast rider, but wanting to perserve my Yamaha FJR1300 as much as possible in the unlikely event it was ever laid down, I decided to investigate crash slider installation. Most of the crash sliders I looked at required cutting holes in the fairings. Not the best solution. Doing more research through the Yahoo Group YamahaFJR1300club, I found there were crash sliders available that did not require any modifications to the FJR fairings. I called Wild Hair Accessories in Glendale, Arizona and spoke with Irlan Berk. He was quite helpful and quickly shipped the GSG Mototechnik Safety Crash-Pad Set  Moko Sliders  to me. I received the package by the end of the week. So now for the installation of those Moko Sliders. 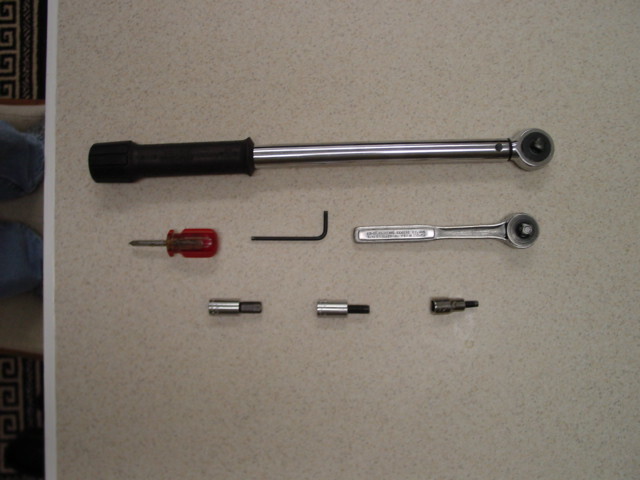 The tools that will be required are pictured above. 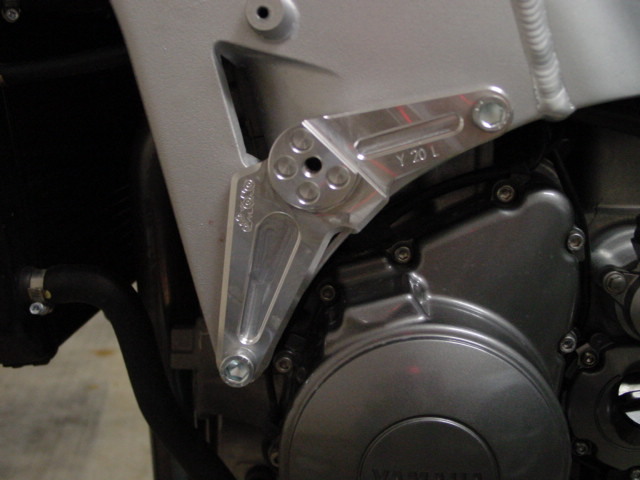 They consist of: a torque wrench for the hexhead bolts; a 4mm hex wrench for the fairing fastners; a 6mm hex socket if you wish to double-check the two hexhead bolts on the right side of the engine that pinch the sleeves the engine bolts go through; a 8mm hex socket for the Moko Slider to Moko Base bolts; a 10mm hex socket for the replacement engine mounting hexhead bolts; a socket wrench; and a phillips head screwdriver for the plastic pop-up quick fastners. 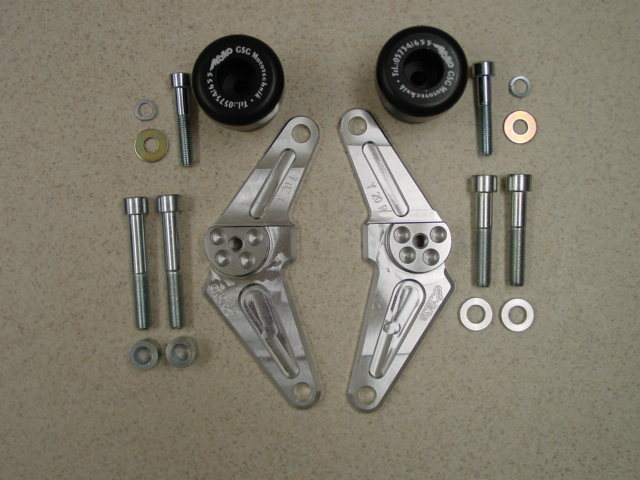 The parts included in the Moko Slider Kit are pictured above. 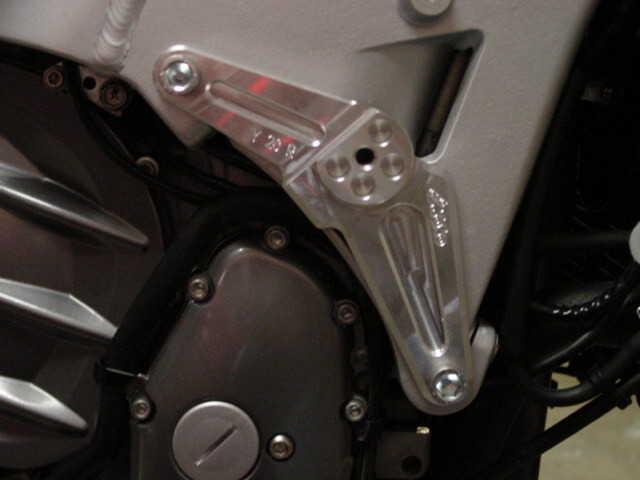 There are specific parts for the left and right sides of the FJR. 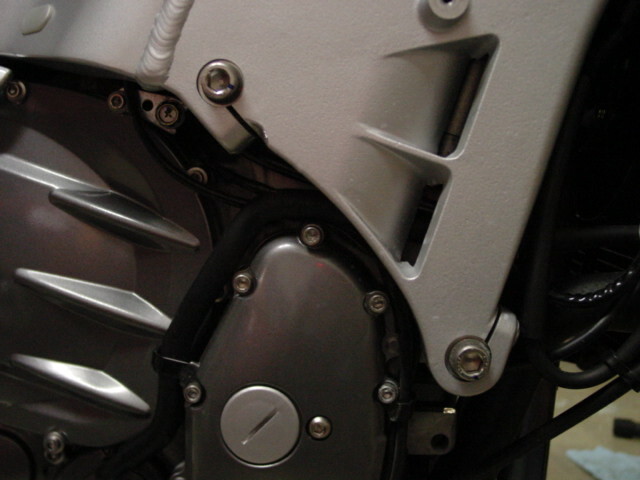 Note the longer 80mm long 10mm hexhead bolts and the 15mm thick spacers are for the left side of the bike, and the shorter 65mm long 10mm hexhead bolts and thinner 5mm thick spacers are for the right side. Those parts are laid out showing the left and right side bolts and spacers together. The two large washers, two lock washers, two 8mm hexhead bolts, and the sliders pictured at the top may be put on either side. First you will need to remove the fairing (cowling) halves from both sides of the FJR. This will entail removing the five 4mm hex screws from the left side fairing, the two 4mm hex screws from the front bottom cowling, and one hex screw from the bottom where the fairings meet. There are five 4mm hex screws to remove from the right side fairing. Don't forget to remove the two phillips head pop-up plastic quick fastners from the inside of the fairing on the left hand fairing side and the one on the right hand fairing side. 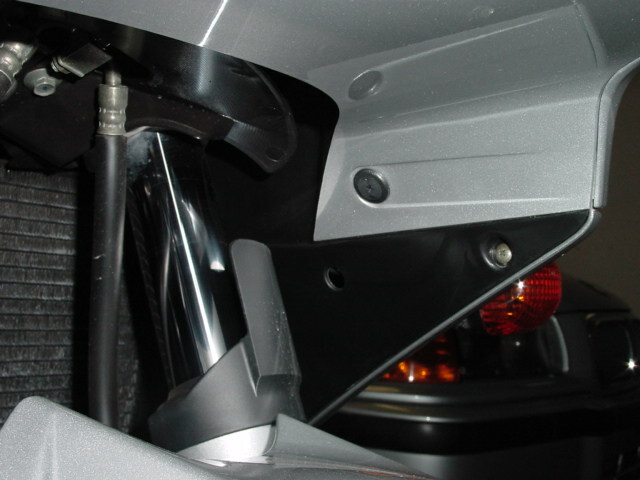 These are found at the front on the inside of the fairings up inside by the forks and radiator (left lower one shown). Be careful when removing the fairings so the paint does not get damaged. 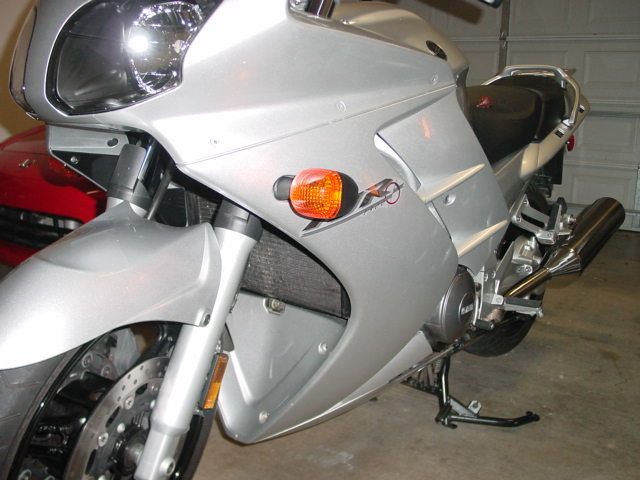 You will need to unplug the front running lights and blinkers to fully remove the fairing halves. It may be a good idea to label, or write down which color wires get inserted into which connector. On my FJR, the wire colors on left side matched the mating wires at the plug connectors, but the right side did not due to different color coded wires in the wiring loom for the right side. Here is a photo of the right side of the engine. The bolts that will need to be removed are the two 10mm hexhead bolts mounting the engine in the frame on each side. I'd recommend starting on the right or left side, removing one engine mounting bolt and then replacing it with the proper spacer, slider base, and bolt from the Moko Slider Kit. [Ed: Better is probably to start with both sides loose, then torque the left side first, per the FSM] Snug the combination up before proceeding to the second engine bolt on the same side. Removing both bolts on the same side may allow the engine to shift out of alignment with bolt holes in the frame. Once the spacers, slider base, and the two new 10mm hexhead bolts are torqued to 40ftlb (55Nm), proceed to the other side. 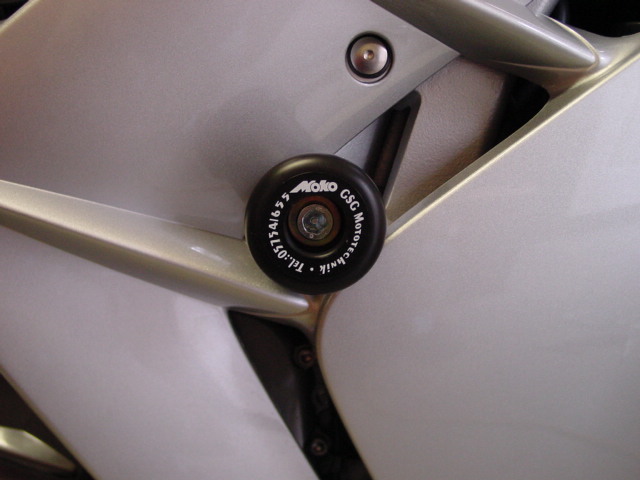 The photos above show the Moko Slider Bases mounted to the frame. Doing a test fit with the actual slider mounted to the base. Don't tighten up the slider 8mm hexhead bolt yet. 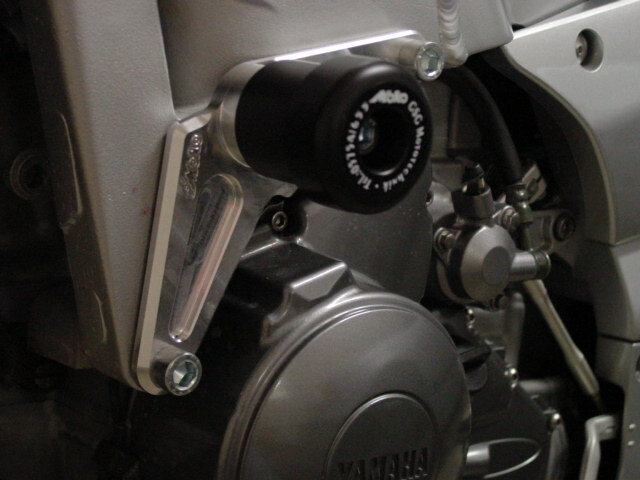 The slider can not be mounted until after the fairing is installed. Next, install the fairings back onto the FJR. Be careful of the paint and alignment. Don't forget to put back all of the plastic pop-up quick fastners in their respective mounting places. 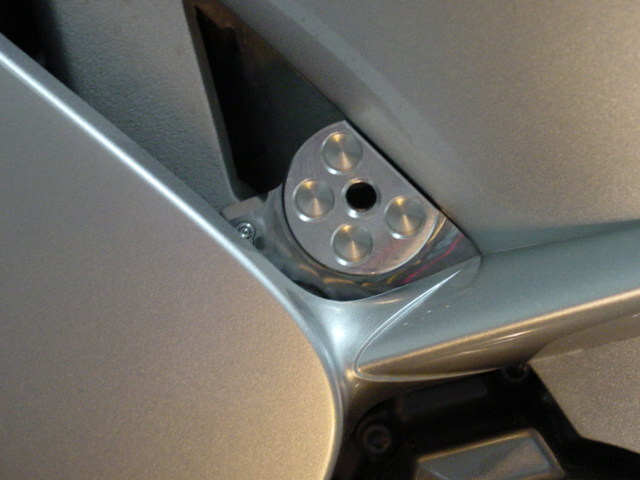 Also, ensure the clear plastic washers are put on the hex screws that are on the painted portions of the fairings. 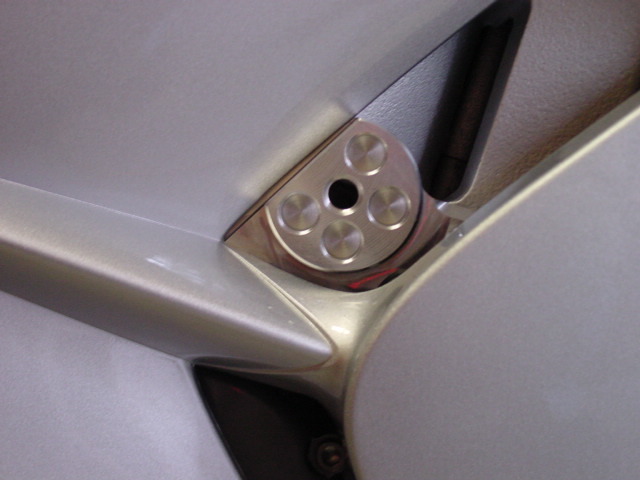 The photo above shows the Moko Slider Base through the installed fairings. No modifications necessary. Nice fit. The final step is to put the 8mm hexhead bolt through the lock washer, large washer, and slider and then mount the combination to the Moko Slider Base. Torque the 8mm hexhead bolt to 29lbft (40Nm). ...and there you have it. The Moko Sliders are a nice addition. Copyright © 2003, by D. Butterfield and H. Marc Lewis. All rights reserved.